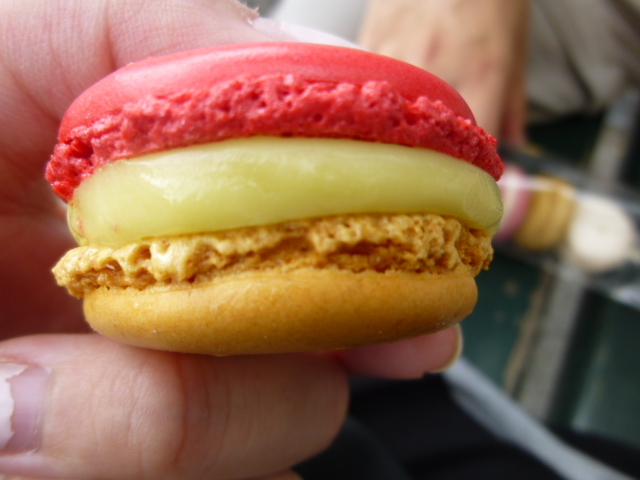 Macarons only weigh a few grams, but that’s enough to leave your senses quivering with pleasure. Their thin, crisp shell, slightly rounded shape, tempting colours and tender interiors draw devotees to devour them with their eyes, and caress their smooth surface. Their flavours solicit the nose and, when one bites into that crisp shell, the ears tingle with pleasure and the palate is finally rewarded. 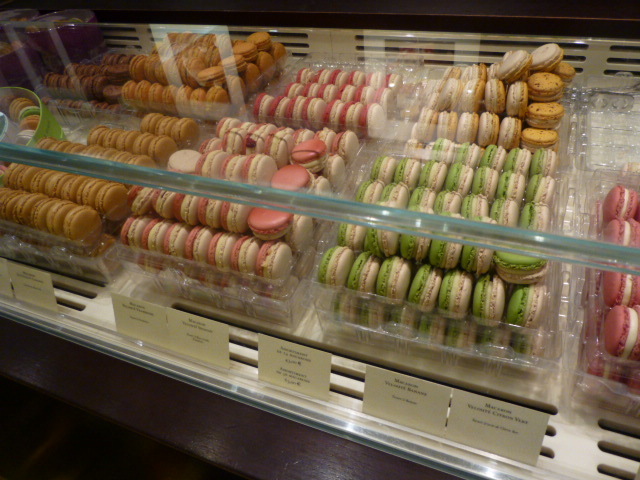 One of the items on my Paris bucket list, was to sample macarons at both of the famous macaron houses: Ladurée and Pierre Hermé. We were lucky enough to enjoy Ladurée’s rose and salted caramel macarons as part of our our honeymoon lunch on the Champs-Élysées. 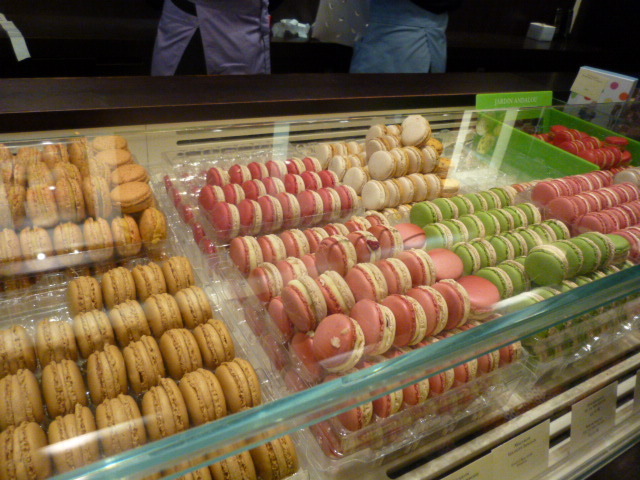 That left sampling macarons from Pierre Hermé, and we were anticipating the project with relish. 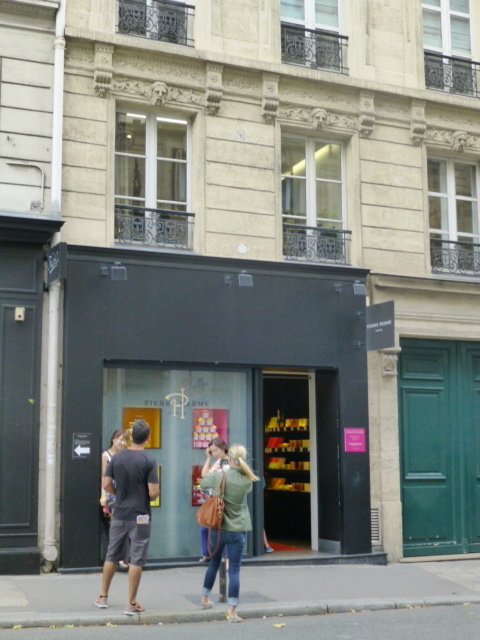 Pierre Hermé had worked at Ladurée as a pastry chef, and left to open his own shops in 1998. 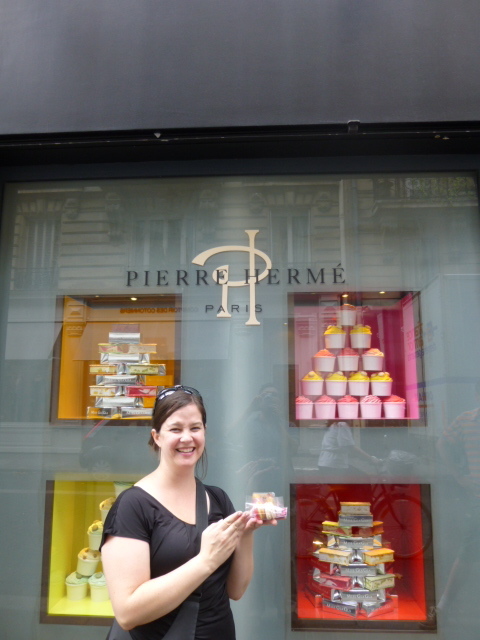 On one of our final afternoons in Paris, Mr. KitchenOperas and I left our apartment and traipsed off to the Pierre Hermé boutique near the Jardins de Luxembourg, in the Latin Quarter (72 Rue Bonaparte in the 6th arrondissement). 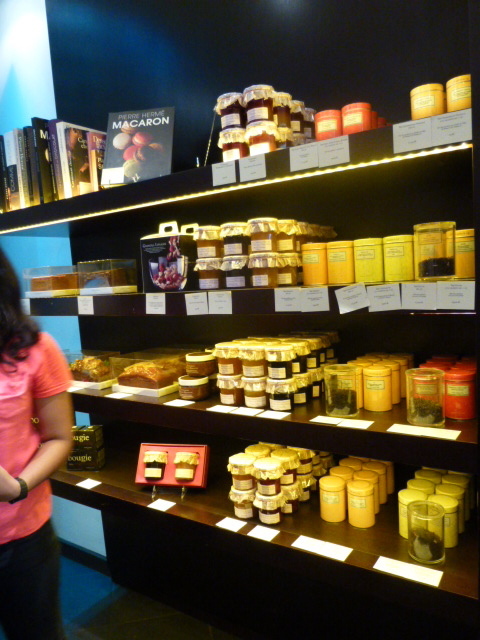 Right before we arrived at the Hermé shop, we turned onto Rue Bonaparte and heard quite a racket. It sounded like a demonstration, with a booming man’s voice proclaiming something angry through a megaphone. 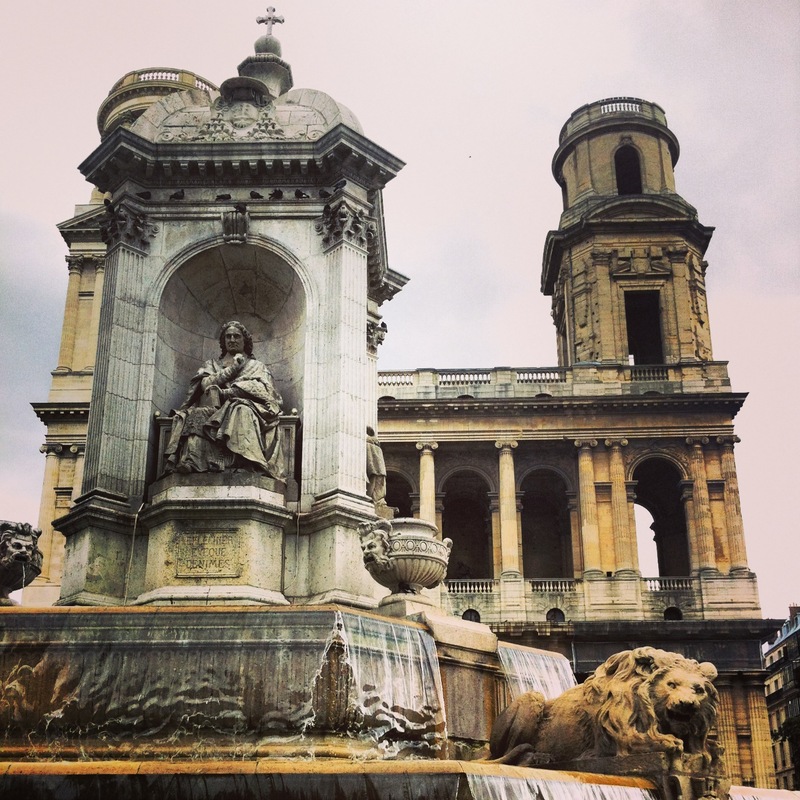 We kept going down towards all the noise, and were pleasantly surprised to find ourselves in front of Place Saint-Sulpice, a beautiful public square outside of Saint-Sulpice Catholic church. Behind the Fontaine des Quatre Evêques (Fountain of the Four Bishops) was the source of all the noise — a congregation of boys with some older teenagers yelling instructions at them. They all wore matching khaki uniforms, so we assumed they were a troop of something like Boy Scouts. The boys were climbing up into the fountain with a big French flag, and their parents were all around encouraging them. I was just waiting for them to break into the big number from the musical Les Misérables: “Do you hear the people sing? Singing the song of angry men? It is the music of a people who will not be slaves again!” … but alas, they never obliged, and instead yelled some military-sounding chants back and forth at each other. 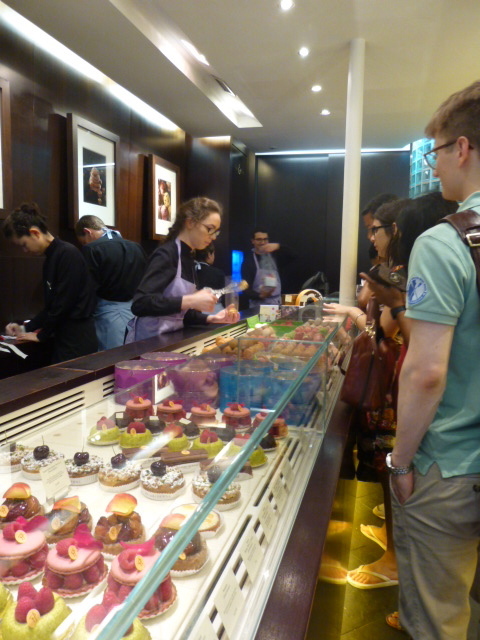 Once I passed all the luscious pastries (and yes, that is a pink Ispahan in the bottom left corner of the above photo), I felt compelled to order quickly at the macaron section of the counter, in order to keep the line moving. Infiniment Chocolat Pérou: Dark Chocolate from Peru. 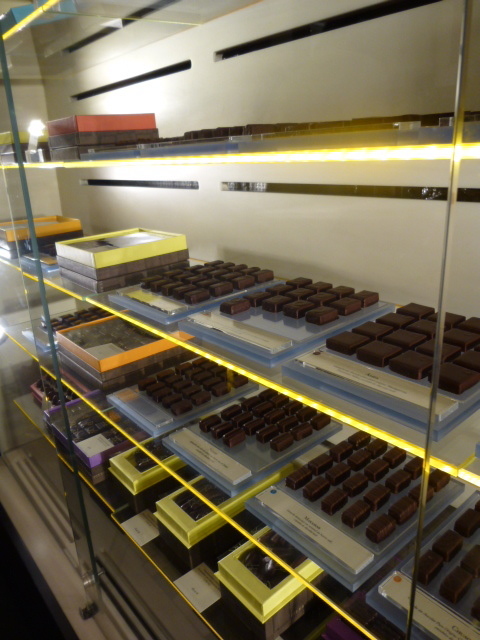 Some of the flavours we got were standards from the Pierre Hermé collection and labeled Infiniment (“Infinite”): caramel, rose, and jasmine. And each of them tasted “infinitely” of their flavour. 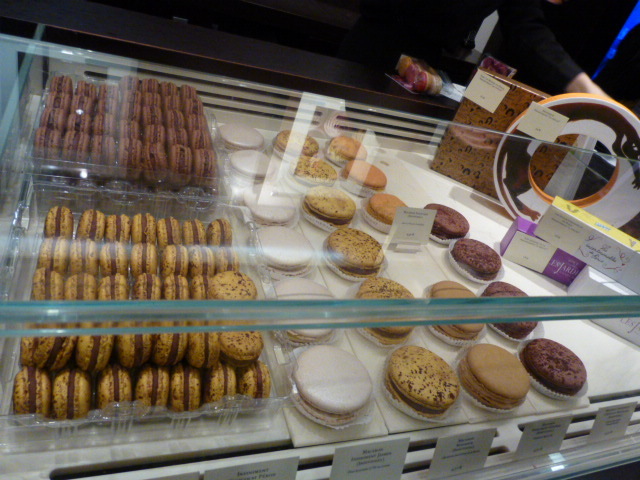 The Infiniment Caramel had a deep and buttery caramel flavour, which of course (being in Paris) had just a hint of salt. I love when caramel has that almost-burnt taste, and this caramel flavour did not dissapoint. The Infinitement Rose burst with a rose scent and taste, and dragged me right back to our travels through India, and the rosewater-flavoured desserts we had there. The Infiniment Jasmin was topped with silver dust and had a sweet floral flavour. It tasted like Jasmine smells, and gave off a jasmine perfume that evoked memories of our travels through India. C’est Doux has a Pierre Hermé Jasmin Macaron recipe on her blog if you want to give these Jasmine Macarons a try at home. And if you’re really going macaron-crazy, Pierre Hermé has put out a whole book on Macarons that is filled with his recipes (!) as well as lots of step-by-step instructions on macaron technique. It’s definitely going onto my wishlist. The Arabesque macaron was also part of the regular collection — an apricot macaron cookie shell sprinkled with crunchy bits of pistachios, and filled with an apricot cream and pistachio prailine. It was one of Mr. KitchenOperas’ favourites, and had a distinct fresh apricot flavour. 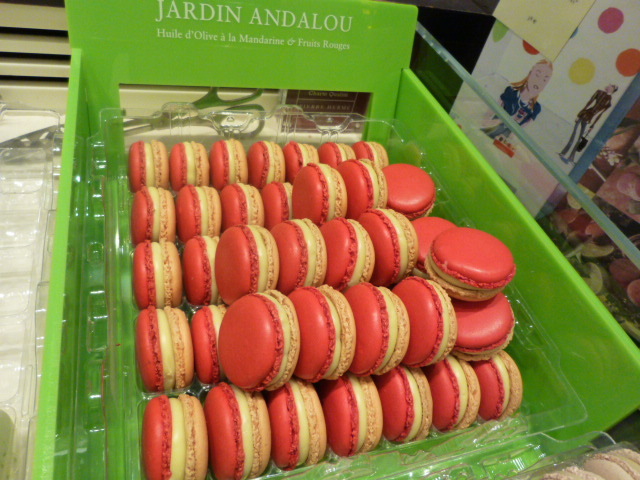 And finally, we tried the Jardin Andalou from the 2013 Les Jardins de Pierre Hermé collection. Each month in the Jardin collection features a different flavour, and this one was Olive Oil with Mandarin Orange & Red Berries. A love match with a flamenco beat. A passionate encounter between extraordinary mandarin orange flavours, unleashed in an olive oil cream, and the vivacity of red fruit dominated by wild strawberries concentrated in a compote. 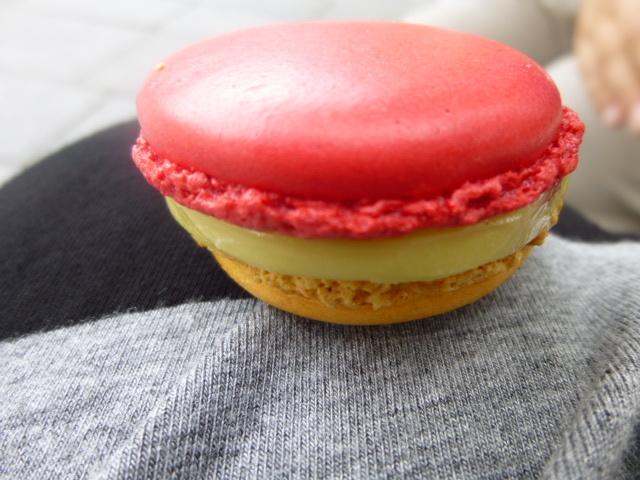 I loved the brightness of the red fruit compote against the smooth and creamy olive oil filling. And how pretty is the two-coloured shell? This macaron captures the quintessence of the “Bonbon Chocolat Nuage” experience. Starting with the note expressed by Bordier’s smoked-salt butter, this chocolate macaron sets off a few subtle swirls of smoke of its own. Ignited by a pinch of curry, the smoky note gradually gives way to the smooth chocolate taste of the ganache, which then completely carries us off our feet! A successful tryst between timid chocolate and a smoky flavour expressed with consummate delicacy. Curry, smoky & salty butter, and chocolate? Just tell me where I should line up! 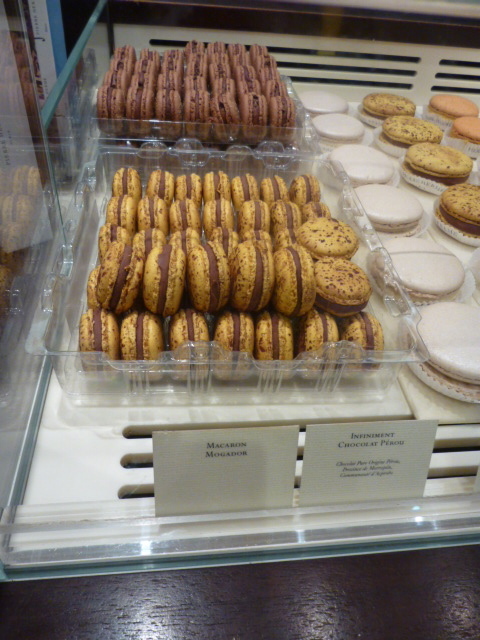 And so, where do I stand in the grand macaron battle between Ladurée and Pierre Hermé? 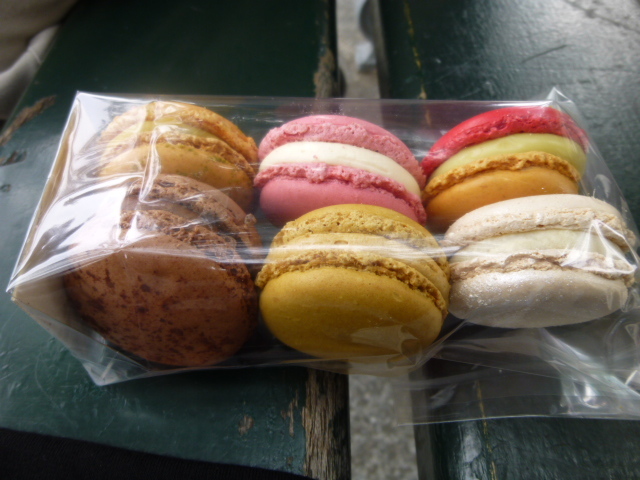 If I had to choose one macaron provider for the rest of my days, I would have to lean towards Pierre Hermé’s stronger flavours, richer fillings, and fuller-bodied shells. 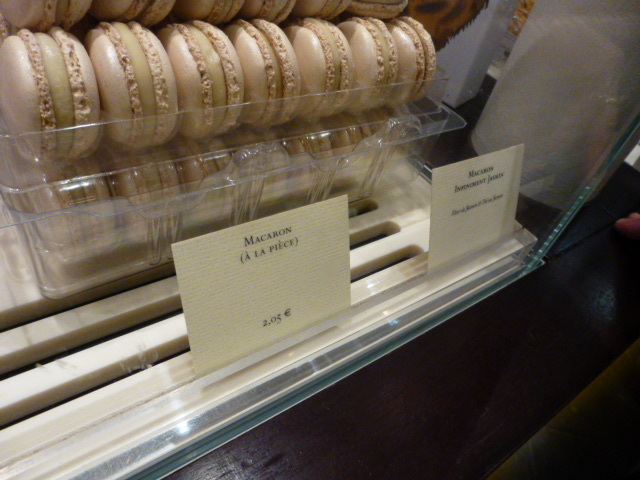 The Ladurée macarons were more ethereal, with the shells dissolving in your mouth and leaving wisps of flavour behind. 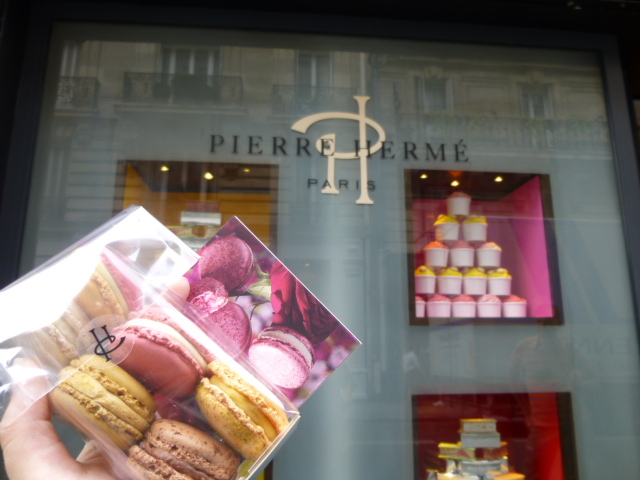 To each her own macaron, and my own is Pierre Hermé.